This was a bit of a weird book! I thought it was going to be a murder/mystery but turned out to be a love story. It seemed a bit old-fashioned. 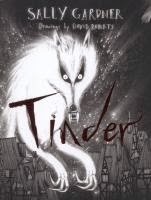 The book is set in 1692 about a man who goes on an adventure and meets a woman named Safire. He has escaped from a war (he was a soldier but has run away). Safire is then taken away and most of the book is about how he tries to get her back. He finds a 'tinderbox' and starts having strange dreams. It's a crazy book! Parts of the book was good - some not so good. Maybe it would make more sense if I'd been five years older. A lot of big words were used that I didn't understand. Rated: 2½/5 - It wasn't very age appropriate. It didn't suit me - although I managed to get through it - it must have been okay. This book is AMAZING! It's a romance/adventure novel. A girl named Karou is living in the human world but also lives in another dimension. This other world is called Ertes where there is a war on which has been raging for hundreds of years. Karou is a Chimeron which means she is a blend of creatures, but the Angels are trying to kill the Chimeron. The story is mainly about how Karou finds out about being a Chimeron and tries to get back to Ertes. She has to save the Chimeron and the human worlds. It was really engaging and amazing, I couldn't put it down. When my mum came into my room I wouldn't listen because I wanted to keep reading. Rated: 5/5 - A Masterpiece! It's about some cousins who go to stay with their uncle and his pet crocodile. It turns out that the uncle is evil. Adele hears that the silverware and precious books are missing and finds them in her cousin Isobel's coat. She returns them before they get into trouble. Rated: 5/5 - It's good so far.